Published on Monday, June 17, 2013. 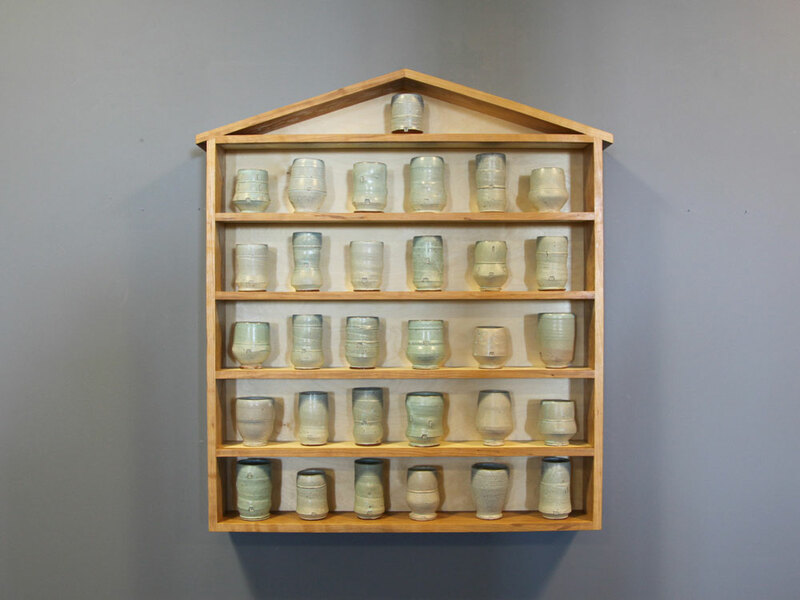 Michael Strand's misfit cup "orphanage" before the beginning of the May 23 Library Salon Series. All cups in the image were made by Strand. Photograph by Julie Hanus. There are few people you will ever meet that are as inspiring as Michael Strand. Having just a five-minute conversation with the artist, community activist, and associate professor of visual art at North Dakota State University will convince you that the biggest accomplishments can spring forth from an individual trying to make his or her neighborhood better. In a world that is measured on the national scale, by petabytes of information and in billions of dollars, Strand creates art projects that connect individuals and foster connections that go beyond appearance and building a sense of community. 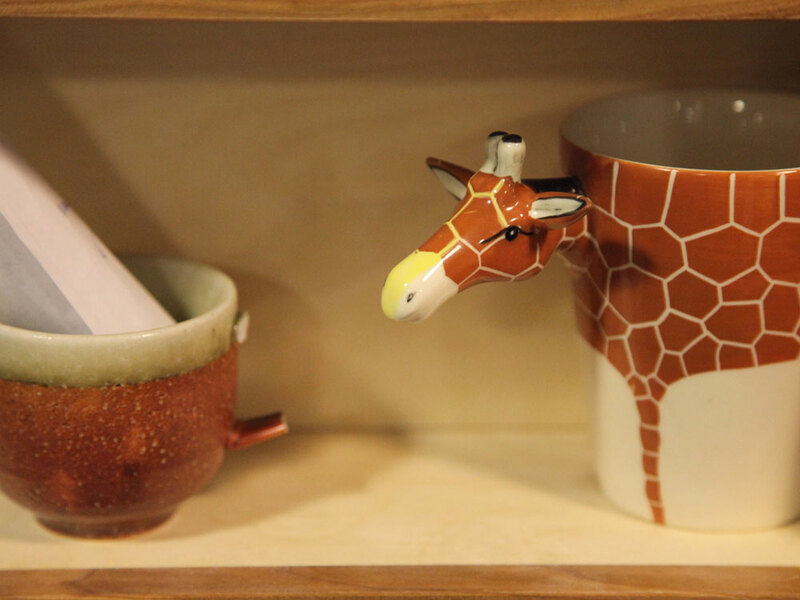 His projects often focus on ceramic objects that are small in size and used for everyday activities. Items such as cups and bowls may seem too mundane, too familiar to address larger problems, but when you think about what these objects are used for – cooking and sharing a meal, talking over coffee and tea, the survival of family traditions through heirlooms – you realize that they are crucial instruments in building relationships between large groups. Strand's salon event at the ACC was the premier venue for the work in Minnesota (he has already exhibited it in Fargo, North Dakota; Houston, Texas; and Tallinn, Estonia). 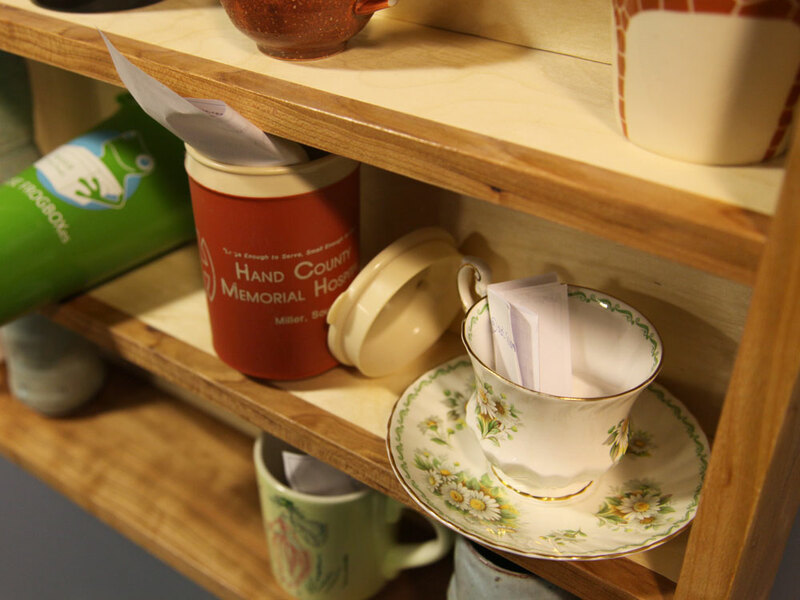 Attendees came with great stories and quite the array of cups. Drinkware ranged from (owner-admittedly) tacky to bizarre and stories brought both laughter and a few tears. In the end, the project did what Michael Strand sets out to do in his projects: bring people together and help them realize the common values that are shared by all (and participants got a shiny new cup to boot). Check out the pictures in the gallery to see some of the cups exchanged during the evening. Staff members from the ACC also had the opportunity to sit down with Michael Strand and talk to him about his work and projects. See some of the highlights from our interview with Strand and prepare to be inspired! A wonderful array of misfit cups took up residence in the "orphanage." Photograph by Julie Hanus. 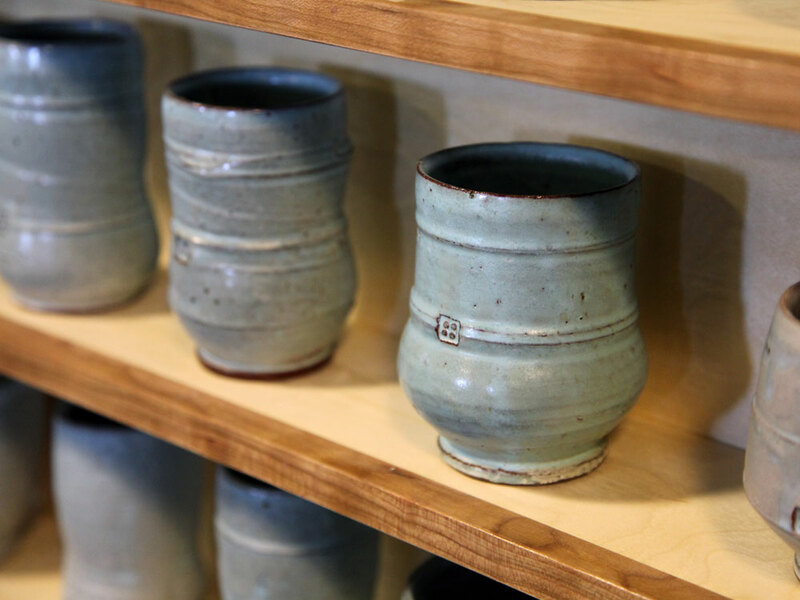 Close-up of Michael Strand's beautiful ceramic cups. Photograph by Julie Hanus. 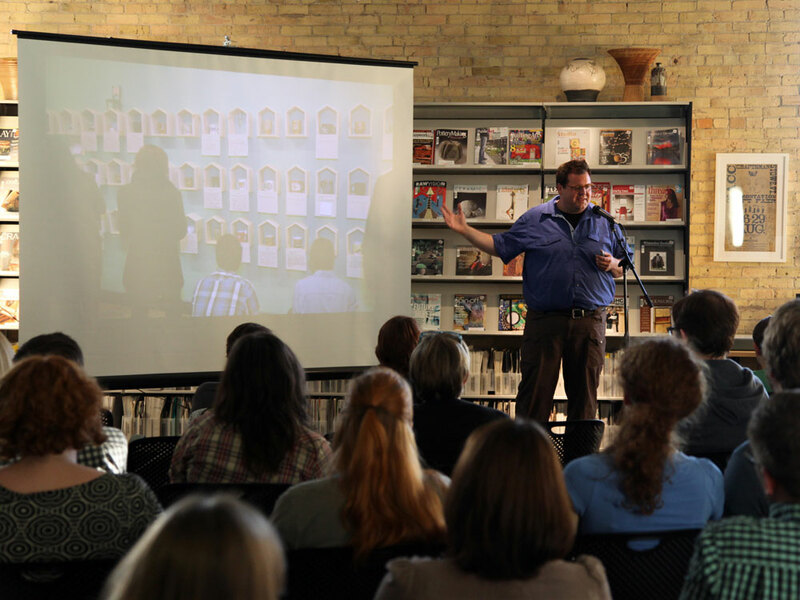 Michael Strand talking about his work at the May 23, 2013 Library Salon Series. Photograph by Julie Hanus. 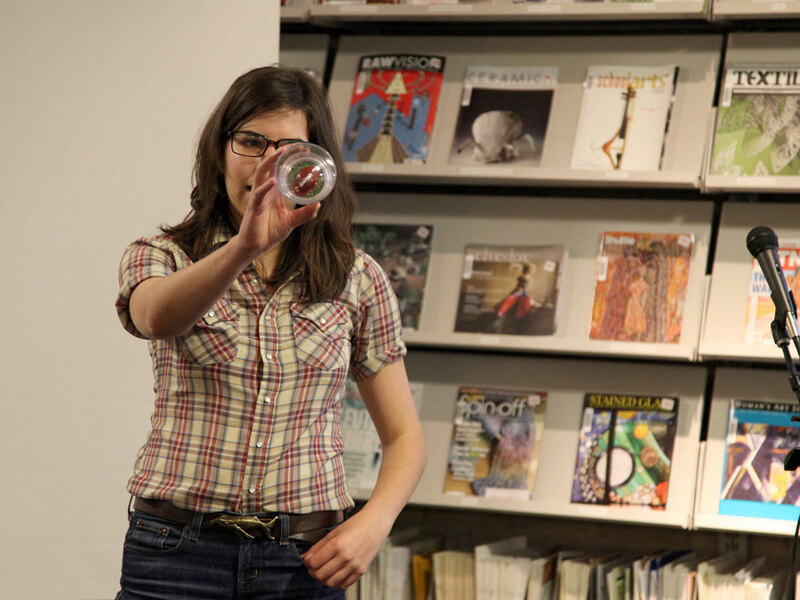 A Salon Series attendee presents her misfit cup to the audience. Photograph by Julie Hanus. 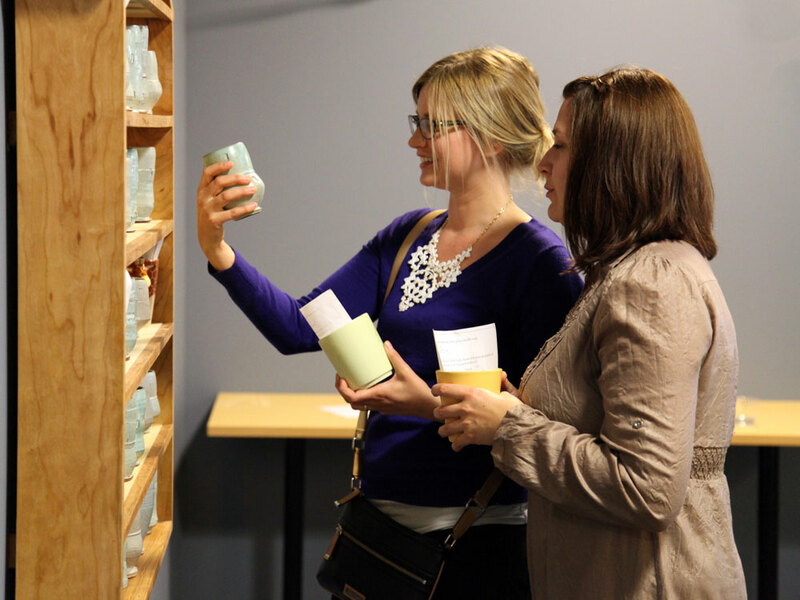 Salon Series attendees deciding which Michael Strand cup they will exchange for their misfit cup. Photograph by Julie Hanus. 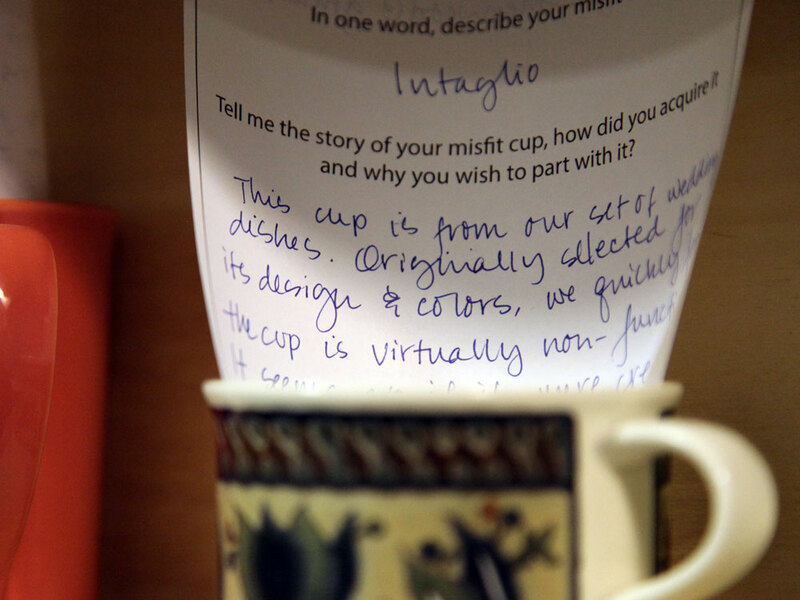 Misfit cups that were exchanged included a story about the cup and why the owner was willing to let it go. Photograph by Julie Hanus. The misfit cups will have a new life as part of Michael Strand's future work on the project. Photograph by Julie Hanus.